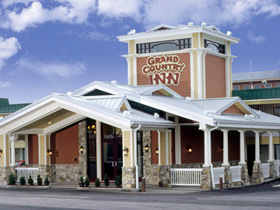 Grand Country Inn is more than a place to stay — it’s a lodging experience! With the perfect location and huge, family-friendly amenities like the year-round indoor water park, you won’t find a better place to stay during your Branson vacation! The large indoor/outdoor water park is the first of its kind in Missouri, but the special features don’t end there. Discover shopping, dining, attractions, and shows all in one place! You’ll find buffet dining, pizza, custard and more in the onsite dining options, and shopping that offers far more than a typical theater or lodging gift shop. The indoor fun is endless! With glow-in-the-dark black light mini-golf, laser tag, mini-bowling, bumper cars, an elaborate 36-hole mini golf course, extensive arcade, and a soft play area perfect for the little ones, you’ve definitely hit the lodging jackpot with Grand Country Inn! When it’s time to see a show, remember that the Grand Country Music Hall features some of Branson’s best performers. All these remarkable amenities and you haven’t even heard about the rooms yet! Comfortable rooms include custom artwork, a refrigerator, a microwave, a 40” flat screen television, and country-style comfy quilted spreads and cheerful decor. You’ll also find complimentary features like WiFi internet access. Don’t forget to venture out and enjoy everything Branson has to offer; Grand Country Inn’s central location on the Hwy 76 strip gives you convenient access to everything. So, stay where the whole family can play...at the spectacular Grand Country Inn!